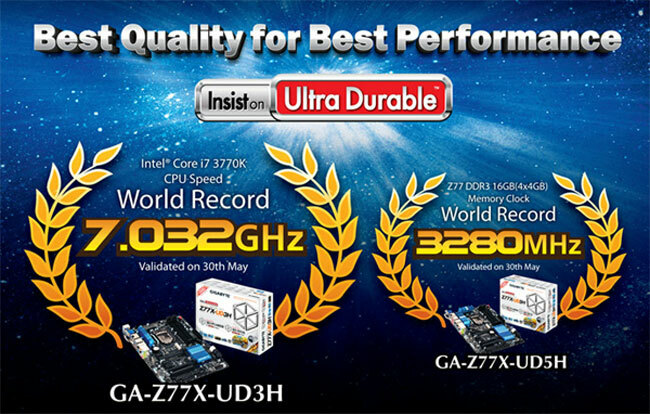 Gigabyte has announced that it has laid claim to a couple overclocking records in the computer geek community using its GA-Z77X-UD3H and GIGABYTE Z77X-UD5H main boards. The UD3H board was used to set the CPU speed overclocking record. An overclocker going by HiCookie pushed the UD3H mainboard and an Intel Core i7 3770k CPU to a fully validated 7.03 GHz clock speed. That clock speed that required the use of liquid nitrogen to keep the processor cool. The same overclocker also broke the highest memory speed for an Intel Ivy Bridge platform.